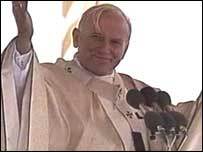 Catholics from all over Ireland flocked to see Pope John Paul II during his visit in September 1979. He was the first Pope to visit Ireland and was greeted by vast crowds during a hectic schedule which included Dublin, Drogheda, Galway, Limerick and Knock. But perhaps the most enduring memory of that Papal visit was his impassioned plea for peace in Northern Ireland. 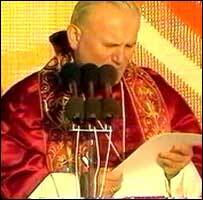 About 250,000 people at Drogheda heard the pontiff make a direct appeal to the paramilitaries. His visit to Drogheda, just across the Irish border, was the closest the Pope got to Northern Ireland. His advisers had feared that, with the north in the grip of the Troubles, the Pope could be a target for loyalist paramilitaries and that his visit would heighten tension between Catholics and Protestants. A month before his pilgrimage was scheduled to start, the Queen's cousin, Lord Louis Mountbatten, had been killed in an IRA bomb attack on his boat in County Sligo. Hours later, on 27 August, 18 British soldiers were killed in two bombs at Narrow Water Castle near Warrenpoint, County Down. In the end, it was decided that the pontiff would restrict his visit to the republic - even though Lord Mountbatten had been killed there. This meant that a Mass at St Patrick's Cathedral in Armagh - Ireland's ecclesiastical capital - had to be cancelled. But this did not deter enthusiastic crowds from travelling from the north to see the head of the Catholic Church. Throughout his visit, which was accompanied by a high level of security, his empathy with young people was evident, particularly at a youth Mass in Galway. He used his visit to Limerick, to urge the Irish government not to bring in divorce. However, divorce was introduced after a referendum in 1995. The pontiff also celebrated Mass for more than 1.25m people at Phoenix Park in Dublin - one of the largest crowds ever seen in Ireland. Nine cardinals and 100 bishops also assisted in the Mass. In his homily, the Pope acknowledged the close links between Ireland and the Catholic Church at the time. He pointed to the high rate of Mass attendance and he drew parallels with his native Poland. "On Sunday mornings in Ireland, no one seeing the great crowds making their way to and from Mass, could have any doubts about Ireland's devotion to the Mass," he told the crowd. Archbishop Sean Brady, the Catholic Primate, met the Pope several times when he was based at the Irish College in Rome. "He was a man who was deeply engrossed in prayer, this union with God with Jesus Christ," said Archbishop Brady. "He identified with the poor and the weak in the face of the strong and he spoke out in defence of their rights, especially the right to life. "His vision of the needs of the world will be remembered as one of his great features." Although the Pope never returned to Ireland, the country was never far from his thoughts. He visited the United Kingdom in May 1982, and pleaded for peace in Northern Ireland. In 2004, the Irish bishops invited the Pope to visit Northern Ireland - 25 years on from his first trip. They held a series of celebrations to mark the 25th anniversary, culminating in a national day of celebration on 19 September.